Brunch catering in northern VA just got a new name – Chutzpah! The establishment, started in 2001, is serves authentic New York food that has so far won over hearts of the locals. Brunching is a serious affair and so only the real deal in food and drinks will do. You will know you are walking into an authentic deli from the aroma that hits you upon entry into Chutzpah. From the pickles and homemade coleslaw to over-stuffed sandwiches that you will probably not finish and then some chicken soup to warm your soul, the deli menu is extensive and totally worth checking out. Chutzpah was established with the intention to capture families as well as foodies who can’t get over great good, which is why the menu has a kiddie corner to cater for the little ones in your life. Have a large group that you need to feed? No trouble, just book a table in the 60-seater establishment and have your meeting over yummy beef brisket and salads. 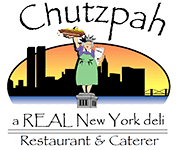 Chutzpah accepts orders for delivery too that you can do from the comfort of your home. Brunch starts from 9AM to noon if you plan to come have in the restaurant, but we do cater to groups of 10 people and above. While the menu is extensive and will cater to different palates, we are flexible enough to accommodate requests that we may not have, or variations of things we already have – this is specifically for catering services. We request that you send your order several hours before your event to give us enough time to prepare everything as per your request. Several repeat clients can’t decide whether it is the ambience or the witty crew that keeps them coming back, but there is more to us than that. Authentic New York specials is what you serve when you have a name such as ours. Meals are made from scratch using only the freshest ingredients available. The extensive menu caters to each member of the family and we even create space for children so you can all spend time together. Can’t find something on our menu but want it for your event? Just talk to us and we will find a way to incorporate it. Although we take lots of pride in our menu, we are also flexible to customer demands especially when catering to events. Just let us know at least 48 hours before the event and we will put together a sumptuous customized meal. Even better than our reasonable prices for group meals is the generous portions we serve. We believe in over-stuffed sandwiches, overflowing plates and generally, food that will fill your guests up as it should. The platters are not only well-priced but they are also heaped ideally. Our payment options include cash, corporate and personal checks, company accounts, and selected credit cards. The delivery fee depends on location and food is delivered at the agreed time – not a second later. For all you brunch catering needs in northern VA, talk to us. Good New York deli food, fairly priced, service is friendly and quick. Highly recommended! Have Questions About Brunch Catering?